Aloe Juice has traditionally been promoted and used as a digestive aid or folk remedy for arthritis, stomach ulcers and diabetes as well as many other health conditions. R PUR Aloe, by using the whole leaf process, has combined the virtues of the ancient aloe with modern research and technology to produce the optimum nutritional potency in each formula. R PUR Aloe has mastered the whole leaf process to bring you Organic 18X Aloe Vera Concentrate. Traditional methods of refining the Barbadensis Miller plant involve a hand filleting process to remove the gel from the leaf. The leaf is then discarded. Ironically, the largest concentration of the active ingredients, polysaccharides and mucopolysaccharide (Acemannan), are found just beneath the outer surface of the leaf (the rind), which can be bitter, indigestible, possibly abrasive and difficult to refine. The new whole leaf process employed in the making of R PUR-ALOE products allows the cellulose to be dissolved, aloin and aloe emodin are removed. This total procedure is done entirely by a cold process and refining treatment. Maximum efficiency is thus assured, resulting in products rich in polysaccharides including mucopolysaccharides (Acemannan). Aloe Vera contains at least three anti-inflammatory fatty acids all of which are plant sterols. R PUR Aloe is a proud member of the International Aloe Science Council (IASC) which proclaims that each 1x Aloe Vera product must contain between 1,000 - 1,200 MPS per liter of Aloe Vera activity. All of R PUR Aloe's Whole Leaf Aloe Vera products adhere to or exceed this standard. All are tested to assure the specified amount of mucopolysacchride content. John 19:39 mentions aloe as part of the mixture being used for the anointing of the body of Jesus Christ after his death. Nomadic people would dig up thin valuable aloe plants and carry them live to every new campsite for fear that they might not find them growing in their new location. Since the reign of Cleopatra has been applied to the skin to treat burns and minor wounds. 1500 BC, Egyptian Healers Described It in Their Treatisies. The Roman Naturalist Pliny cited many uses for aloe vera in the 1st Century AD. Native Americans recognized it as the 'Burn Plant', The 'Mystery Plant' that heals itself. Indian medicine men jealously guarded their knowledge of its uses. Aristotle persuaded Alexander the Great to conquer the island of Socroto to secure the aloe grown there for the wounds of his soldiers. Suggested Use: Shake bottle before each use. May drink 1 to 4 ounces per day. Mix 1 part of Organic 18x Aloe Vera Concentrate to 10 parts of purified water, herbal tea, or organic freshly-juiced fruit juice. What is the shelf life of the R Pur Aloe if its never been opened? 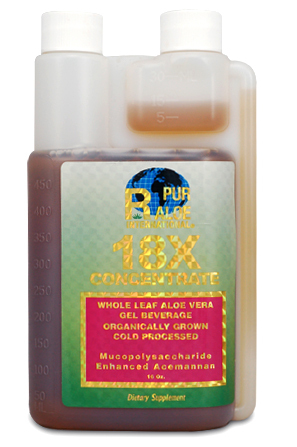 Organic 18x Aloe Vera Concentrate has a shelf life of 3 to 5 years if kept in a cool place. Please explain about sodium benzoate. The food-grad sodium benzoate used in R Pur Aloe is a natural derivative from blueberries. It is NOT the same as the synthetic chemical sodium benzoate and does not contain the possible harmful properties. All Aloe Vera in liquid or gel form must contain some type of preservative in order to keep the product fresh and from turning black. R Pur Aloe has chosen natural sodium benzoate to ensure freshness and purity.